“When the weather is fine then you know it’s a sign; for messing about on the river”! A classic hit in the sixties; but still sound advice because there’s nothing so nice; as messing about on the river, lake or sea. Here at Tallington Lakes Pro Shop we have the good fortune to have over 200 acres of clean, spring feed, lakes to mess about on. We have a large fleet of sit-on-top kayaks; which are predominantly Tootega because we feel they are good kayaks. 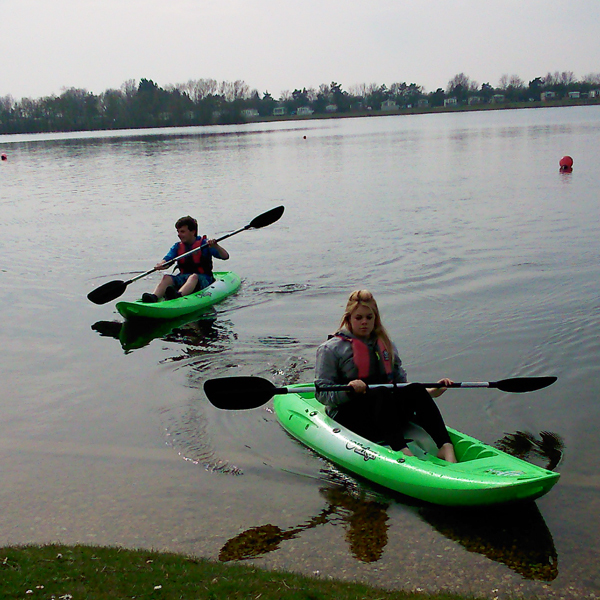 Tootega kayaks on one of Tallington Lake’s lakes! Tootega is a British company, and the sit-on-tops are designed and manufactured in the UK. The guys behind the company are surf kayakers and paddlers, so they know what you need for messing about on the river, lake or sea. For messing about on the river. As messing about on the river. And cruisers and keel boats and some with no draught. Go messing about on the river”. So depending upon your chosen activity; you will need to select a kayak that is suitable. The Pulse series of kayaks are aimed at the surf, beach paddlers who want something to mess about in the waves. The planing ‘C’ shaped hull will help you catch those waves, buts is also quite stable so you can explore a little of the coastline on flat days (including lakes and rivers)! The different sizes (85 and 95) are to accommodate different weights, so yes the 95 is for those who are carrying extra ballast. The 120 is a tandem kayak, so you can share the paddling! The Sector series is for your coastal and river explorer, who will be touring and require a kayak that will provide a fast, efficient, and effortless glide through the water – thanks to a touring ‘C’ vee-keeled hull. It also has more storage space for those all important rations and equipment; giving you the option to stop-off and make camp! Once again the different sizes (110 and 135) depend on weight, but also how much rations and equipment you are carrying! The Prophecy series is for coast and river exploration too! The Prophecy has the performance of the Sector with additional features to make it more comfortable for the paddler: bountiful legroom, adjustable footrests with heel pads, and a raised seating position make this kayak ideal for long days paddling along the coast, river and lake. And for the Fisherman out there: all three of the above come in a Huntsman version! Camouflaged ready so the little (or big) snappers can’t see you! However, for those of us who are not sure where we will be “messing about” they guys at Tooteg are working on a true all-rounder called the Kinetic. Giving the best of both worlds with a hybrid ‘C’ hull to mess about in the surf and cruise through the water efficiently! Messing About on the River was written by Tony Hatch and originally sung by Josh McCrae.